It's Wednesday and that means it is TIME for a NEW Challenge!!! This week will be tricky for some of you and perhaps not-so-tricky for others. We are challenging you to use NO Patterned Paper! That's right! You can create your own patterns using stamps or stencils or whatever, just no printed patterns. Let those 6x6 paper pads rest this week! The Design Team is featuring Taylored Expressions products this week! I picked an adorable Little Bits Fox die and I LOVE HIM! Isn't he adorable?! He totally is. TOTALLY! I wanted a bit of extra somethin' somethin', so I added two strips of the Amy Tangerine Finders Keepers Mini Washi Tape below my fox. I LOVE these tapes. For reals, though. Isn't he just too cute?! He is. I promise. I wouldn't even lie about this, you guys. For reals. The sentiment is from the super awesome Simon Says Stamp Sending and Wishing stamp set. I use this set so much! It really is a staple. Love it! Now it's your turn! 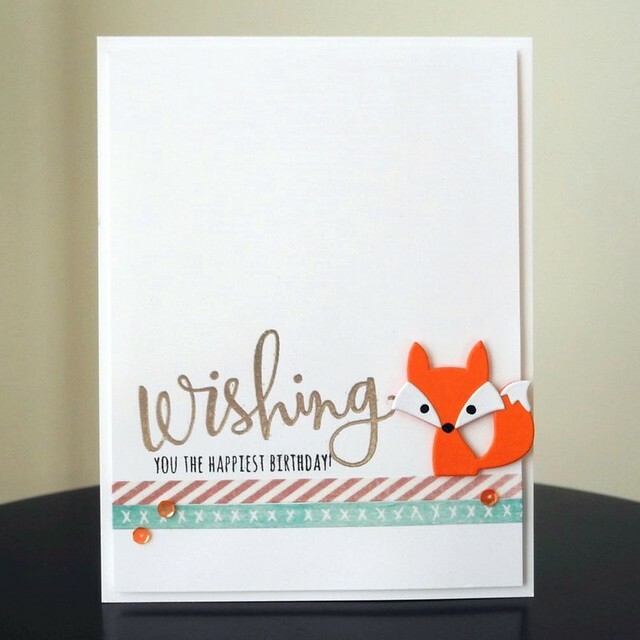 Create something fabulous, but don't forget to skip the patterned paper on this one! We can't WAIT to see what you come up with! One lucky participant will win a $50 Gift Voucher to the Simon Says Stamp Store! Woot! Woot! All links in this post are affiliate links. Your support is always appreciated! Adorable card Jennifer! That fox is too cute!! Great CAS design! dang it! I need that stamp set! thats just what I was looking for the other day!! CUTE card!! 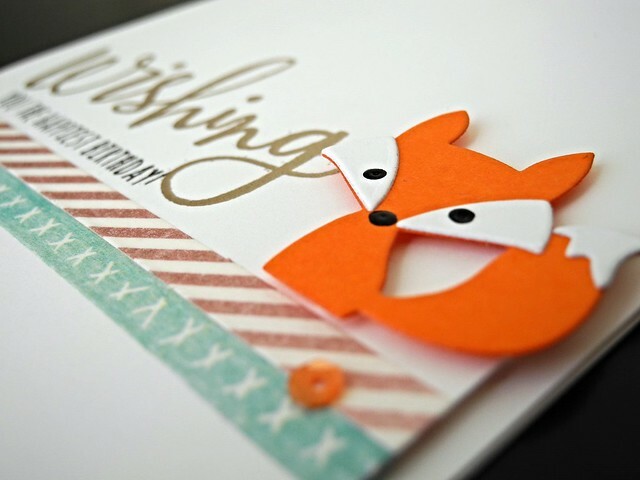 An adorable card Jennifer, I love the cute little fox!! Simply adorable! Love the CAS design. ok you just sold me on the that little fox.. I need it.. your card is SO CUTE..
Oh, that fox is a cutie! Must go and check out that die! hey foxy chic....lol...this is super cute Jingle, he is a cutie! hope you have a fun weekend!